November 16, 2016 – A United Launch Alliance (ULA) Atlas V rocket carrying the WorldView-4 satellite for DigitalGlobe lifted off from Vandenberg Air Force Base, California, on November 11 at 11:30 a.m. MST. Lockheed Martin Commercial Launch Services procured the Atlas V for this mission, which marked the 137th consecutive successful Atlas launch. The Lockheed Martin-built WorldView-4 satellite will more than double DigitalGlobe’s capacity to collect the world’s highest-resolution 30 centimeter commercial satellite imagery and will accelerate the growth of DigitalGlobe’s 80-petabyte, 16-year time-lapse image library. The fifth active satellite in DigitalGlobe’s constellation, WorldView-4 will enhance global transparency and security, power location-enabled applications and services, support the response to global humanitarian crises, and much more. WorldView-4 will orbit Earth every 90 minutes, traveling 17,000 miles per hour and capturing as much as 680,000 square kilometers of the Earth’s surface daily (18 terabytes) – the equivalent of the land area of Texas. The satellite will capture images so clear that viewers will be able to distinguish between a sedan, van, and truck from nearly 400 miles in space – the same technology employed on DigitalGlobe’s other WorldView satellites. The amount of data collected will be equivalent to taking 9,000,000 images a day with your cell phone. Operating at an expected altitude of 617 km in coordination with the DigitalGlobe WorldView-3 satellite, WorldView-4’s data-rich imagery will enable customers to search for new sources of minerals and fuels, manage forests and farms and accelerate DigitalGlobe’s living digital inventory of the surface of the earth. Seven CubeSats were also launched on the Atlas V as an auxiliary payload. The CubeSats, known collectively as ENTERPRISE, are unclassified technology demonstrations sponsored by the National Reconnaissance Office (NRO). The CubeSats rode in the Aft Bulkhead Carrier, developed by the NRO and ULA, on the Centaur upper stage. ENTERPRISE is the fifth NRO mission to utilize ridesharing, but the first in which the organization has partnered with a commercial company. Tyvak Nano-Satellite Systems Inc. served as the integrator for all seven nano satellites. 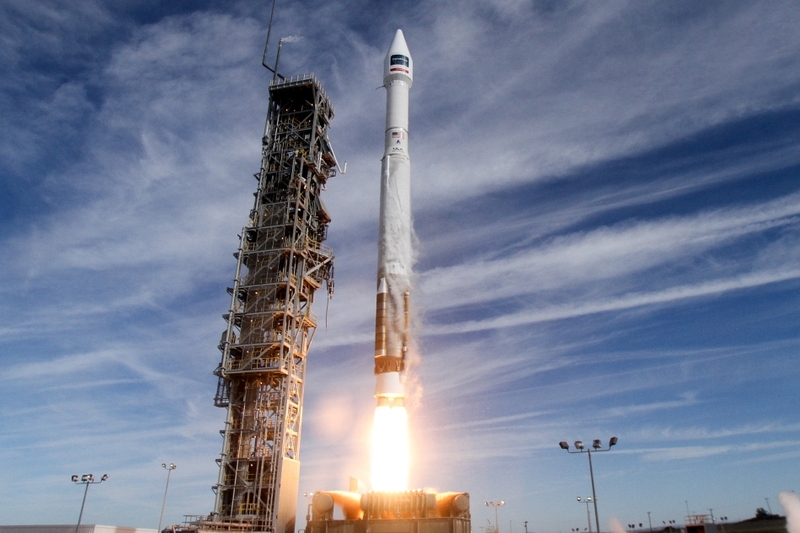 Including this latest launch, ULA has now launched 62 CubeSats into space. WorldView-4 was originally scheduled to launch on September 16, but was delayed due to wildfires that burned more than 12,500 acres and damaged infrastructure at Vandenberg Air Force Base. More than 1100 firefighters battled the blaze.